The importance of infield drills can be summed up by baseball bats. The introduction of composite bats, which produces exaggerated power and is more forgiving of bad contact, increased scoring across the board at all levels of baseball. Changing the materials bats are made of is uncontrollable by the coach and in reality few teams have an absolutely dominating pitcher, and there’s only so much progress a pitcher can make in one year. So what can a player on the infield do to win his coach’s heart and insure his place on the team? Develop outstanding defensive skills which prevents runs from scoring, especially cheap or unearned runs. Let’s look at three infield drills which develops quick hands and feet, the foundation for good defense. Developing a quick exchange from glove to throwing hand is essential for turning quick double plays or getting that fleet footed runner by a half a step. Start in a fielding position with a ball in your glove. For 20 - 30 seconds move your glove in a clockwise motion around each leg, quickly repeatedly exchanging the ball from your glove to your throwing hand. 20-30 seconds may not sound like a lot of time, but you’ll never think the time will end if the drill is performed as fast as possible. Repeat this in a counterclockwise motion for 20-30 seconds. Work on getting through this baseball fielding drill as quickly as possible to train your hands to move faster in and out of your glove. After completing the drill through your right and left legs, try it with your feet together, then in a figure-eight pattern. 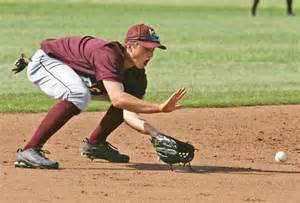 The short hop can be one of the more difficult plays an infielder makes as many times the play must be performed on physical instinct as there isn’t time to read the hop. This is where trained hands instinctively come into play. Facing a partner, who is standing 10-15 feet in front of you, assume a balanced fielding position. Place your throwing hand behind your back and your glove in front of your body. The intent is to eliminate your throwing hand from the equation, which allows more movement of the glove hand. 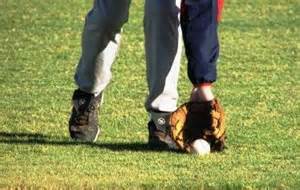 Your partner bounces ground balls, one to two feet directly in front of you, which you field only with the glove. Practice getting your glove in the same angle as the bouncing ball, because it gives you the greatest amount of glove surface area in which to catch the ball cleanly. After 30-40 throws, add to the degree of difficulty by catching then flipping the ball back to your partner from the glove. Learning this maneuver will not only build confidence and control for double plays, but will expand the possibility of getting the double play by eliminating a step of hand to ball to flip. After gaining confidence and speed, "play it live" by bringing your throwing hand to its normal fielding position and squaring up to the appropriate base. Field the ball and make an accurate throw to a third partner or a soft toss net. Alter this drill to include fielding short hops not only straight on, but perform the drill for the forehand and backhand. It’s imperative, whenever possible, to get into the proper fielding position when trying to catch a short hop or a waist-high big hop. For this you need quick and active feet. This rather unique drill will help you develop these quick feet. Don’t try to analyze the physics behind the drill, just realize the body and mind quickly adapt to changes. Begin by assuming a standard fielding position while holding a ball in your throwing hand. Again, be holding a ball while preparing to field a ball. Have your partner either throw or hit medium speed ground balls directly at you. glove only. By holding a ball in your throwing hand the brain knows it cannot count on the bare hand for help, which forces you to get in front of the ground ball and field it. This can also help you learn to get into the correct position faster by counting the number of times the ball bounces or hops. Alter the drill by working at different depths which affects reaction time and body movements. Take 10-15 grounds balls at each infield depth—infield in, halfway, double play depth, two-out depth. Then with a ball in still hand; change to playing the drill live incorporating throwing to bases after fielding each ground ball.